What’s one thing all successful people have in common? Passion. They love what they do in their respective fields. The definition/measure of success depends on who you ask. Whilst some chase fat stacks of cash, others chase happiness; some are after improved health or a better physique. Ask anybody you know if there is a facet of their life they would like to improve and most likely than not, they would have an answer for you. But is wanting it enough? If everyone wants to be rich why does nobody want to slog out 60 hour working weeks to build their fortune? The simple, straight up, no BS answer is this… LAZINESS. We’re all about shortcuts. Shortcuts to financial freedom, a more successful career or in our case being in the fitness industry, that ever elusive magical pill to a better looking physique. If there is no shortcut or no ‘easy fix’ to what we aspire to in life, what then separates the successful people to the unsuccessful ones? One thing that all successful people have in common is that they LOVE what they do! Watch the video below of a behind the scenes take of the 69th Academy awards. With the pressure of millions of eyes watching around the world, where many people would succumb to pressure, this camera director relishes in the opportunity. This is passion. This is doing something to the best of one’s ability and loving it! all those years of hard work, all those years of experimentation and in some cases failing, have led up to this one victorious moment. It takes time and dedication to finally produce the results you are happy with. The difference between the successful and unsuccessful is that successful people are willing to put in the hard yards for what they love. Whether it’s on a professional, social, or sporting level, the ones that really excel are the ones who do it because it’s their passion. How do you make it your fitness (or anything for that matter) your passion?…. MINDSET. Mindset will affect the quality of your work. We tend to put more effort into things that we like doing or know that we can excel in. The tasks we are not so good at, not so much. In reality, what we need to improve on should be what we put the most time and effort towards. This is how we improve and better ourselves. Whether it’s making more time to exercise or finally nailing the perfect squat, everything requires time and effort. Consistency and persistence is the key. It may not work how you would like the first time, but with persistence it eventually will. The time it takes depends on the effort you put in. What to do: Accept that everything takes time. Perfection is only produced through failure. Learn from your downfalls and aim to do better. Don’t beat yourself up when you fail (because you will), learn from them. You only really fail when you quit. Goals are important to any prospective accomplishment. It sets the benchmarks of progress and allows you to monitor your overall performance. Specific: Have a clear and distinct objective. For example ‘get healthy’ is too general. When are you ‘healthy’? A more specified goal would be ‘to lose 5 kg’ or ‘have a healthy blood pressure reading of 140/80. Be as specific as possible. Measurable: Have a clear way of measuring your progress. How will you know if you’ve achieved your goal or not? Losing 5kg or recording a healthy blood pressure reading are measurable in numbers. To ‘get healthy’ doesn’t. Attainable: Can you realistically see yourself achieving this goal? Make sure your goal isn’t too far fetched. It must be challenging yet achievable. Relevant: Is it relevant to the overall progress. How will you benefit? Time: Have a deadline. This creates a sense of urgency provides extra motivation. ‘Losing 5kg in 12 weeks.’ is a SMART goal. 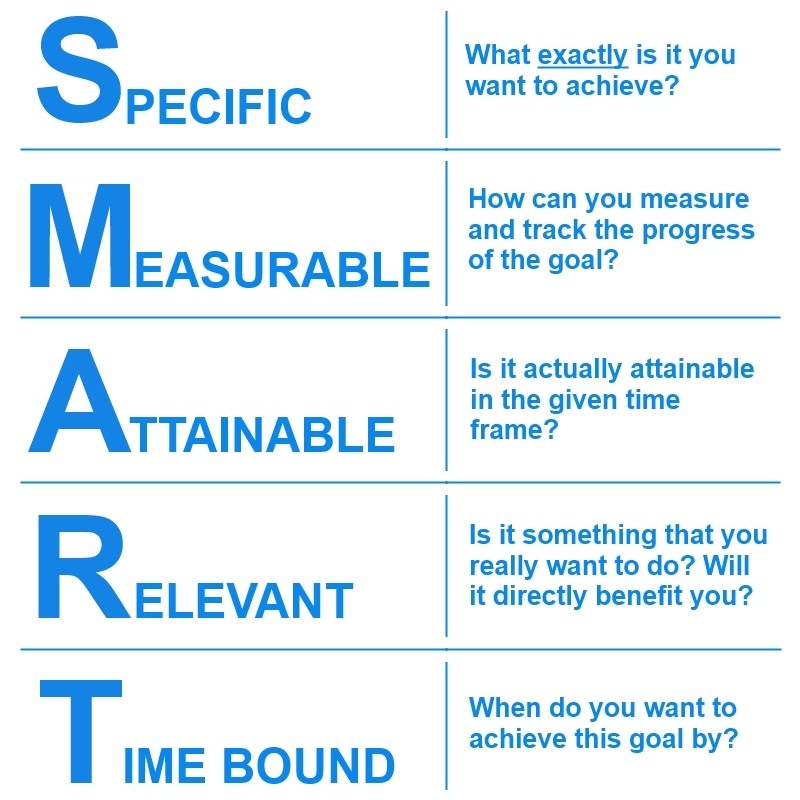 What to do: After distinguishing your SMART goal, set smaller goals. How will you lose 5kg in 12 weeks? A smaller SMART goal within the goal itself. For example, one smaller goal could be ‘to exercise at least 3 times per week’. Take pride in your small accomplishments and celebrate them. After all the sacrifices and hard work, it’s important to give yourself a pat on the back sometimes, even if you are yet to accomplish your BIG goal. This is imperative to truly loving what you do and creating a passion for it. All too often, we look how far we have left to our accomplishment and never give ourselves enough credit for how far we’ve come. This can cause stress on the goal itself and possibly deter you from continuing on the path to success. Enjoy the journey not just the destination! What to do: Celebrate the your small achievements with a small celebration and the big achievements with a big celebration. A celebration could be as simple as buying a new outfit after accomplishing 4 weeks of physical activity 4 times a week. Celebrate in a way that you find enjoyable. The key to staying on the road to success is enjoying not only the destination but the journey itself. If the journey has too many barriers to overcome this could cause you to breakdown and give up altogether. Be realistic, celebrate your victories and pat yourself on the back every once in a while. Enjoy what you do and make it your passion!